The western genre is most obviously synonymous with America, and is arguably one of the few unique cultural products to emerge from the country. While Spanish westerns had existed prior, the notions of a ‘promised land’ of ‘New Eden’, the taming of the wilderness/frontier, and the conflict generated in the origins of a nation are all uniformly American in nature and allude to the difficulty of the era. The Searchers (1956) perhaps best exemplifies such ideological underpinnings, featuring western icon John Wayne as the tortured lead protagonist. Clint Eastwood’s career was forged through the genre and was capped by the magnificent Unforgiven (1992), which deconstructed the mythology surrounding the cowboy/outlaw and explored the inherent corruption of law officials. Therefore, when superstar auteur Kim Ji-woon (김지운) announced his intentions to direct a Korean western, it was met with some trepidation; how could such an exclusively American genre be molded to suit Korean audiences and reflect Korean history and culture? The apprehension was unwarranted, as The Good, the Bad, the Weird (좋은 놈, 나쁜 놈, 이상한 놈) not only addresses such concerns but extends beyond them, becoming a worthy addition to the genre in its own right. Set in the 1930s Manchurian desert, The Good, the Bad, the Weird portrays a land of lawlessness and violence. Korea is occupied under Japanese rule, and refugees flee north to escape persecution. However, the land is far from a safe haven as immigrants from all nations struggle to survive. Within this fray is ‘The Weird’ train robber Yoon Tae-goo (Song Kang-ho (송강호), who stumbles in and out of danger with an apparent nine lives. Performing his usual heist, Tae-goo unintentionally procures a treasure map rumoured to be the resting place of unimaginable wealth from the Qing Dynasty. 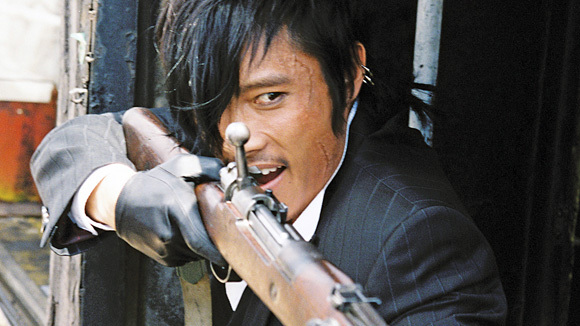 However, ‘The Bad’ Park Chang-yi (Lee Byeong-Heon (이병헌) and his gang of bandits also desire the map, and give chase. Behind them is ‘The Good’ bounty hunter Park Do-won (Jeong Woo-seong (정우성), seeking to bring both men to justice. As the motives for chasing each other continually change, the emphasis is not on a gritty-realist portrayal but rather an action-orientated dark-humoured revisionist style. As with Sergio Leone’s The Good, the Bad and the Ugly (1966), each character has their own distinctive brand of death-dealing and mayhem such as Do-won’s long range rifle that blows miscreants through walls, Chang-yi’s knife wielding blood lust, or Tae-goo’s bizarre luck in dropping opponents. The light-hearted nature is Indiana Jones-esque as the film moves from one action set-piece spectacular to the next as bad guys and worse guys alike are blown to bits. As with all Kim Ji-woon’s films, the characters can be enjoyed on multiple levels. On the surface, they are fun and generic protagonists; on a more penetrative level they are allegories of Korea in-flux, the personification of national identity under Japanese occupation. They are fragments of a whole, each one without a country, each one on the run from a tortured past and chasing the other. The inevitable stand-off provides catharsis not only for audiences in need of resolution, but also for themselves as they simultaneously desire each other but want to be the last man standing and solidify their/Korea’s identity. Director Kim Ji-woon is renowned for genre-play, taking pre-existing conventions and flipping them to create something vibrant and fresh. The Good, the Bad, the Weird is no different as the gritty ol’ west is eschewed for fun and action set pieces which are shot in incredible fashion. The mise-en-scene is superb in every frame, with the consistent use of long takes adding considerable realism and enjoyment. Kim Ji-woon also employs the use of crash-zoom shots to great effect, but does so in his unique style that functions simultaneously as parody and pastiche of the genre. The multi-tiered action sequence in the Ghost Market is pure joy as Do-won flies on rooftops, Chang-yi cuts a swathe through other villains within buildings, and Tae-go simply tries to survive as he navigates the claustrophobic streets. 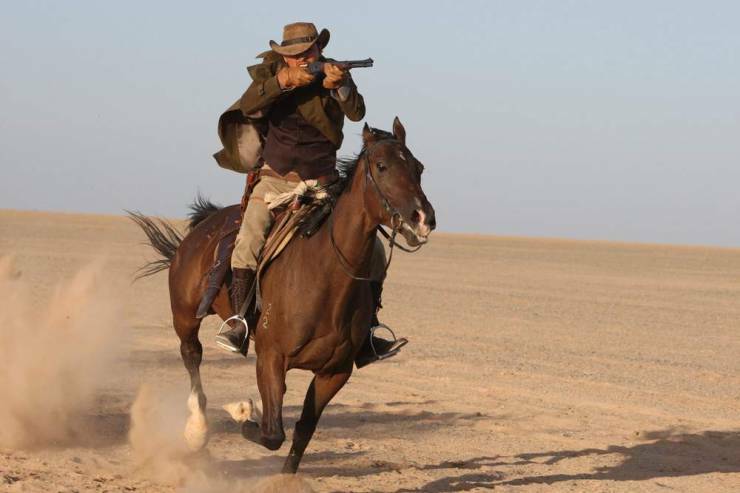 Similarly the final chase sequence between the titular characters, marauding Manchurians and the Japanese army is exhilarating as the camera weaves between everyone involved while bullets fly and the body count rises. The Good, the Bad, the Weird is a zany, fun-filled revisionist take on a traditionally American genre. Kim Ji-woon makes it a uniquely Korean production primed with historical and cultural anxieties. As the pace of the film is frantic to say the least, there is very little in the way of character development or dramatic, poignant scenes as to why the map (and the rush for the treasure) is so vital for all involved. Instead, The Good, the Bad, the Weird is an action-packed love letter to the genre, one that provides incredible enjoyment from start to finish.